From time to time we’d like to feature a short question and answer with one of the writers and scholars who visit the Library. Those of us who work at the Library frequently have the chance to discuss the projects and learn about the work of the researchers who come here. We thought we would share that experience beyond our walls. This month Aurelie Basha i Novosejt of the London School of Economics discusses her work on Vietnam. Ms. Basha also writes a blog for the online presence of the journal Global Policy. I’m working on my PhD in International History at the London School of Economics where I’m looking at withdrawal plans from Vietnam under the Kennedy and Nixon administrations. I’m trying to understand what were the major motivations for withdrawing and how different the withdrawal plans were in their details. Furthermore, I’m looking at this specifically from the perspective of the Office of the Secretary of Defence: what was his agenda and how much influence did this have on the plans themselves. What sparked your project? Was there an “ah-hah” moment? The “ah-hah” moment came when I was watching a press conference given by then Prime Minister Gordon Brown where he talked at length about “Afghanization”. It’s not entirely surprising, from a PR perspective, that we don’t hear that word anymore as it’s such a throwback to “Vietnamization”. However, as a firm believer that we have something to learn policy-wise from history, I thought it would be worth exploring withdrawal from Vietnam to see if there were any lessons there that could apply today. Also, as a PhD student, you’re under a lot of pressure to come up with something original and innovative so a second “ah-hah” moment came when I started reading a little more and noticed that Robert McNamara, under the Kennedy administration, was the leading advocate for withdrawal. At first glance, this is so incompatible with his established image as one of the main architects of the war. So I wanted to understand why he, and a Secretary of Defence more broadly, would be so keen on withdrawing when you would assume, to be blunt, that war is his raison d’être. What’s the Kennedy connection? What were you working with at the Library? 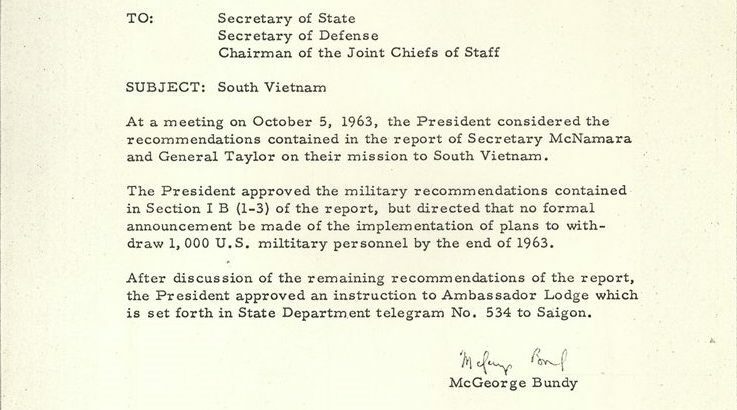 As a historian, my research is primarily archive-based which means that I sift through personal notes, memos, letters and other documents from the main participants in the decisions on Vietnam in order to glean patterns and to really understand what was important at the time. This is my first project of this kind so it was a pretty amazing experience to see first hand some of the personal letters and comments that were sent around; it really adds a human dimension to research. At the Kennedy Library, I listened to the presidential recordings (tapes of discussions held primarily in the Oval Office) and consulted relevant papers specifically on Vietnam (for instance, in the National Security Files on Vietnam) but also on tangential issues. For instance, I looked at correspondence on the balance of payments deficit that was occurring at the time and at discussions on the aid and defense budgets. 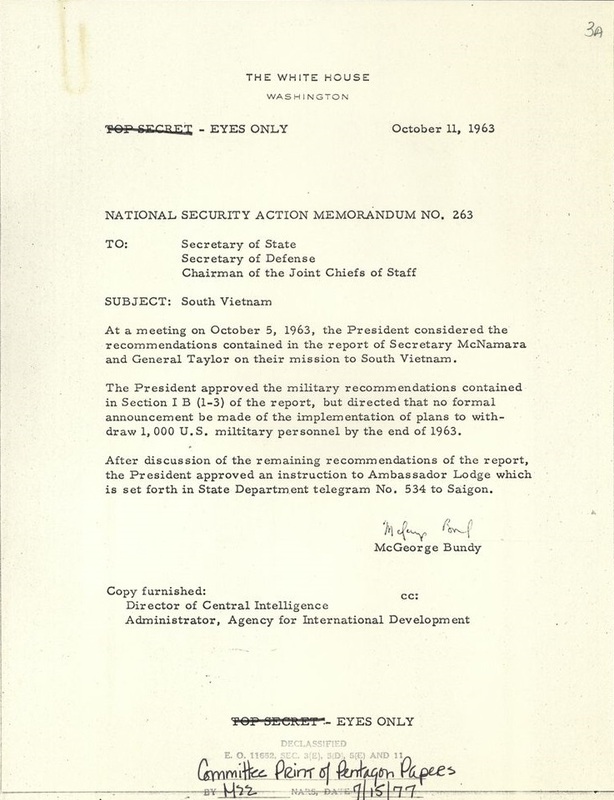 These allow me to contextualize the issue of Vietnam and get a more objective sense of its relative importance to Kennedy and his closest advisors. I’m also very fortunate that a number of new documents on this issue have recently been made available to researchers. For instance, at the Kennedy Library, I looked at John Newman’s papers: he wrote a book on Kennedy’s withdrawal plans a few years back and drew heavily on military archives that aren’t easily accessible. At the Library of Congress, I looked at McNamara’s personal papers, which were made available just last year. And, of course, now the Pentagon Papers have been released online.